Academic and educational support: scholarships exist that cover full tuition fees. Accommodation: the University provides apartment facilities. Social integration with support to language learning and daily life matters: these include a bridging course and mentoring programmes. Legal advice and psychological assistance provided by university experts. UB cooperates with stakeholders in different countries collaborating in academic and research matters in order to ease the difficult circumstances that refugees experience. UB organises different activities to inform, train and raise awareness of the global refugees and humanitarian crisis, its causes, consequences, actors, etc. addressed to civil society. 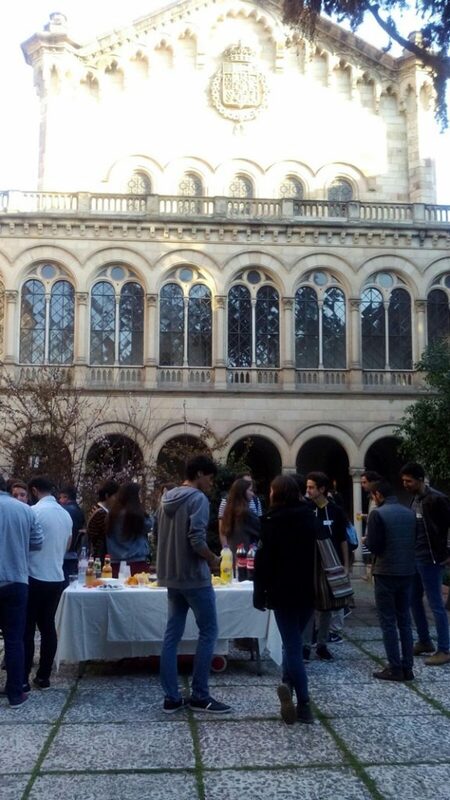 First Meeting of linguistic exchange between Syrian students and volunteer students from the University of Barcelona. © University of Barcelona. 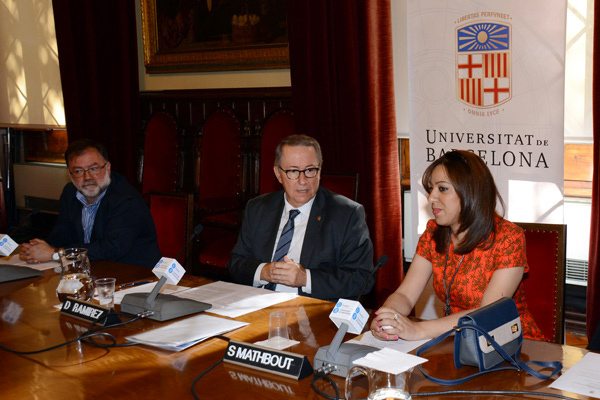 UB Support Programme Presentation on 17 September 17, 2015, with the director of the UB Solidarity Foundation, Xavier López, the rector of the University of Barcelona, Dídac Ramírez, and student Shifa Mathbout. © University of Barcelona. 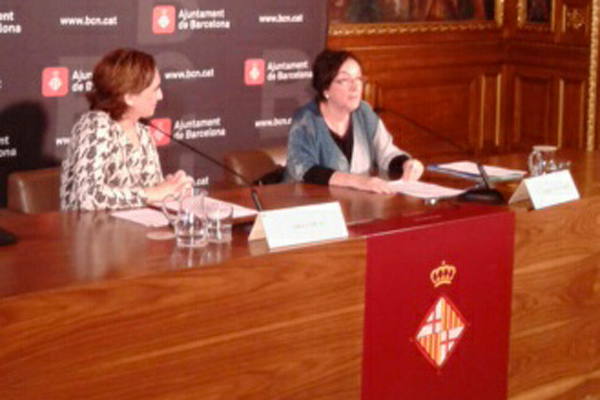 Signature of the Agreement between the Barcelona City Council and the University of Barcelona. © University of Barcelona. How many will be reached in the future? At least 15 per academic year. The University of Barcelona Support Programme is addressed to students with recognised refugee status as well as asylum seekers. The University of Barcelona Support Programme further develops the social responsibility (third mission) of our institution. In a globalised world, universities are global actors, and the UB has the commitment to contribute with its resources, facilities and knowledge to advance in a more peaceful and fair world with the basis of cooperation and solidarity. The University of Barcelona Support Programme is coordinated by the UB Solidarity Foundation. The UB Support Programme has a precedent in a former initiative that took place during the Balkan War. This prior initiative was active during the period 1991-1995 and offered accommodation and free tuition to Bosnian refugee students located in Barcelona. The initiative ended with the war, and occasionally, but not in a systematic way, the university helped refugee students fleeing from conflicts. Yes, the bridging programme “Transition to graduate studies and training in human rights”, one of the action lines of the Support Programme, is co-funded by the City Council of Barcelona. The agreement between the University of Barcelona and the Barcelona City Council will be renewed annually. We are additionally developing projects at the local level with four metropolitan city councils and we are working on the extension of the local government networking. Based on collaboration agreements we are also working with different NGOs specialised in refugees and migration in order to share experiences and knowledge, and provide specific services such as Spanish courses for foreigners, accommodation, etc. .
We are cooperating with other universities in European or regional projects focused on promoting the access to the university of refugee students. We are working to consolidate the Support Programme. There are important changes that are being implemented due to the programme, especially at the administrative level (protocols, acceptance and recognition mechanisms, etc. ), but also at the strategic level. We are in touch with different initiatives at the University of Barcelona (for example, the APS (Learning Service Programme) initiative, Prometheus (addressed to vulnerable students) initiative, etc.) and we are starting to work together in order to identify common actions, synergies and strategies. The Support Programme (free tuition, accommodation…) is funded by internal budget. The bridging course is co-funded by the University of Barcelona and the City Council of Barcelona. Awareness raising and training projects are co-funded by the University of Barcelona and local governments. We are partners in different European projects ongoing (RESCUE, InHere). Some activities such as the linguistic exchange are based on volunteering.